1:18 compared to yesterday, we made a new high, but could not hold it-a sign of weakness. 1:08 I went with this early entry because I knew that passing Solar noon at 1:00 might change things. 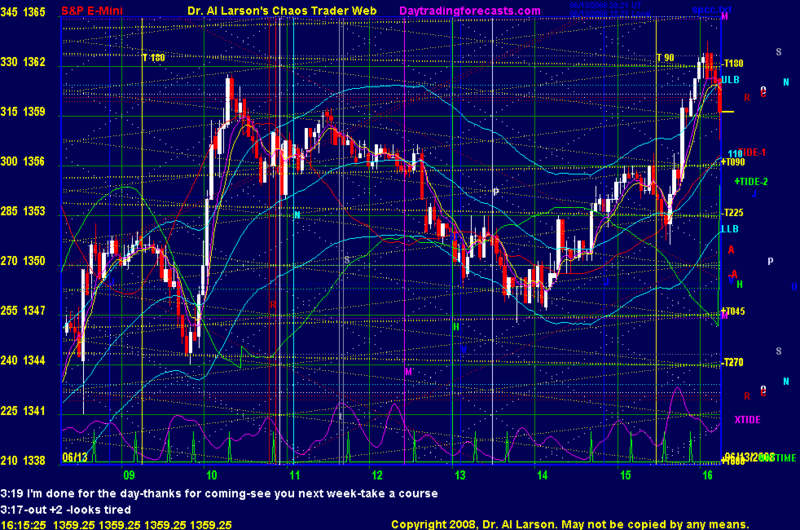 12:07 Yesterday the market rallied then conested, then turned down at the T120 timline on the SPMoonGrid chart. on the train when he is really going to the next station, and jump off before he parks it again. 10:55 now we have a break of the last low, and a penetration of the 110 EXMA that is curling over. 10:14 we were tracking the green +tide, then got an inversion to the red -Tide, creating the "hook and go"
10:10 That was a trade that set up going into the trade time. The 20/110 EXMA's did a "hook and go"
So we may have to just wait out the a congestion; Staying out of a congestion saves money and frustration. 6/13/2008 9:00:54 AM Mountain dp58:: GM Al; SP1Day appears to be stalled.